Scientists at MIT precisely dated the rocks in which the earliest dinosaur fossils were discovered in the southwestern United States, raising questions about when dinosaurs evolved in North America. The Jurassic and Cretaceous periods were the golden age of dinosaurs, during which the prehistoric giants roamed the Earth for nearly 135 million years. Paleontologists have unearthed numerous fossils from these periods, suggesting that dinosaurs were abundant throughout the world. But where and when dinosaurs first came into existence has been difficult to ascertain. Fossils discovered in Argentina suggest that the first dinosaurs may have appeared in South America during the Late Triassic, about 230 million years ago — a period when today’s continents were fused in a single landmass called Pangaea. Previously discovered fossils in North America have prompted speculation that dinosaurs didn’t appear there until about 212 million years ago — significantly later than in South America. Scientists have devised multiple theories to explain dinosaurs’ delayed appearance in North America, citing environmental factors or a vast desert barrier. But scientists at MIT now have a bone to pick with such theories: They . What’s more, they demonstrated that these earliest dinosaurs coexisted with close nondinosaur relatives, as well as significantly more evolved dinosaurs, for more than 12 million years. To add to the mystery, they identified a 16-million-year gap, older than the dinosaur-bearing rocks, where there is either no trace of any vertebrates, including dinosaurs, in the rock record, or the corresponding rocks have eroded. Ramezani details the results of his geochronological analysis in the American Journal of Science. The study’s co-authors are Sam Bowring, the Robert R. Shrock Professor of Geology at MIT, and David Fastovsky, professor of geosciences at the University of Rhode Island. The most complete record of early dinosaur evolution can be found in Argentina, where layers of sedimentary rock preserve a distinct evolutionary progression: During the Late Triassic period, preceding the Jurassic, dinosaur “precursors” first appeared, followed by animals that began to exhibit dinosaur-like characteristics, and then advanced, or fully evolved, dinosaurs. Each animal group is found in a distinct rock formation, with very little overlap, revealing a general evolutionary history. In comparison, the dinosaur record in North America is a bit muddier. The most abundant fossils from the Late Triassic period have been discovered in layers of rock called the Chinle Formation, which occupies portions of Arizona, New Mexico, Utah, and Colorado, and is best exposed in Petrified Forest National Park. Scientists had previously dated isolated beds of this formation, and determined the earliest dinosaur-like animals, discovered in New Mexico, appeared by 212 million years ago. Ramezani and Bowring sought to more precisely date the entire formation, including levels in which the earliest dinosaur fossils have been found. The team took samples from exposed layers of sedimentary rock that were derived, in large part, from volcanic debris in various sections of the Chinle Formation. In the lab, the researchers pulverized the rocks and isolated individual microscopic grains of zircon — a uranium-bearing mineral that forms in magma shortly prior to volcanic eruptions. From the moment zircon crystallizes, the decay of uranium to lead begins in the mineral and, as Ramezani explains it, “the chronometer starts.” Researchers can measure the ratio of uranium to lead isotopes to determine the age of the zircon, and, inferentially, the rock in which it was found. 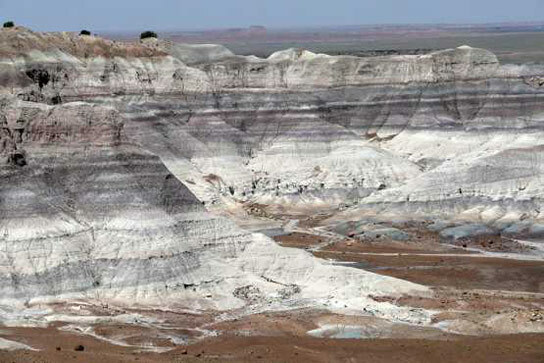 The Blue Mesa locality of the Petrified Forest National Park in Arizona contains the Late Triassic continental sedimentary rocks of the Chinle Formation. 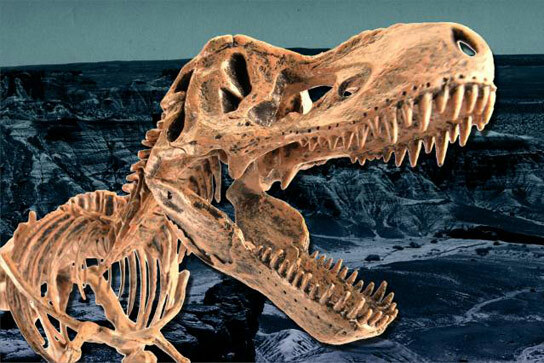 Near Blue Mesa, the oldest documented dinosaur remains in the Chinle Formation have been found. The team analyzed individual grains of zircon, and created a precise map of ages for each sedimentary interval of the Chinle Formation. Ramezani found, based on rock ages, that the fossils found in New Mexico are, in fact, not the earliest dinosaurs in North America. Instead, it appears that fossils found in Arizona are older, discovered in rocks as old as 223 million years. In this North American mix, the early relatives of dinosaurs apparently coexisted with more evolved dinosaurs for more than 12 million years, according to Ramezani’s analysis. While fascinating to think about, Ramezani says this period does not shed much light on when the very first dinosaurs appeared in North America. He says the answer to when dinosaurs first appeared in North America may lie in a 16-million-year gap, in the lower Chinle Formation and beneath it, which bears no fossils, dinosaurian or otherwise. The absence of any fossils is unremarkable; Ramezani notes that fossil preservation is “an exceptional process, requiring exceptional circumstances.” Dinosaurs may well have first appeared during this period; if they left any fossil evidence, it may have since been erased. The new dates provide a framework against which other theories of dinosaur evolution may be tested, says Raymond Rogers, a professor of geology at Macalester College in Saint Paul, Minn., who was not involved in this work. This research was supported by funding from the National Science Foundation. 5 Comments on "New Questions About the Evolution of Dinosaurs in North America"
about 230 million years ago baloney were you there? Someone lives in/breaks into your home, and no one’s there, did it really happen? Yes, because of evidence left behind. Go back to your fairy tale world, Creatard. “The fact that our record starts with advanced forms…. There is no proof about when dinosaurs became extinct. Not finding them in the recent geologic record just means no fossils were formed. Fossil formation requires a cataclysmic event and special circumstances. Rarely do fossils form. The finding of dinosaur footprints and human footprints imbedded in the same rock dating only millions of years old suggests we need to expand the timeline for dinosaurs. Stone carvings found in Peru about 1000 years old also depict man and dinosaurs co-existing although these findings have not been completely authenticated. It seems we don’t know a lot more than we do. Hey there, read a reply you wrote on dark matter, wonder if you could contact me on FB or whatever and discuss some things about physics…. Brian Michael Reeves, Portland OR.